Sometimes, our greatest performances don’t require a judge, a timer or any kind of material reward when a horse’s safety is on the line. Typically, our Performance of the Week column, presented by EcoVet, highlights a show ring or competition pen or racetrack performance from the previous week that we think readers will find inspiring. It’s our opportunity to get a glimpse at disciplines we might not compete in ourselves or get the opportunity to observe, and it can be a nice way to stay in touch with the global competition calendar. This week’s Performance of the Week is none of those things. It’s not an international champion showcasing their latest equine partner; it’s not a champion racehorse putting away the competition and scoring yet another million dollars for his bankroll. No, this week’s performance is something else entirely. This individual is Hayley Moore; she’s a broadcaster for At the Races, a British-based racing network. She’s also sister to Ryan Moore, one of Europe’s top jockeys and the top rider for Aidan O’Brien’s Ballydoyle stables. You may remember his name most recently as the pilot of Mendelssohn. At Cheptstow Racecourse in the UK on Tuesday, Ms. Moore was kitted up with her microphone and various equipment when she noticed a loose horse “Give Em A Clump” galloping around the course. Rather than watch the horse make yet another lap and potentially injure himself, Moore decided to act, stepping into the horse’s trajectory and snagging a rein. While she was literally whipped off her feet and dragged a few steps, she did not let go, successfully catching the loose animal. Hayley Moore – take a bow! Check this out – unreal stuff from our presenter Hayley Moore! 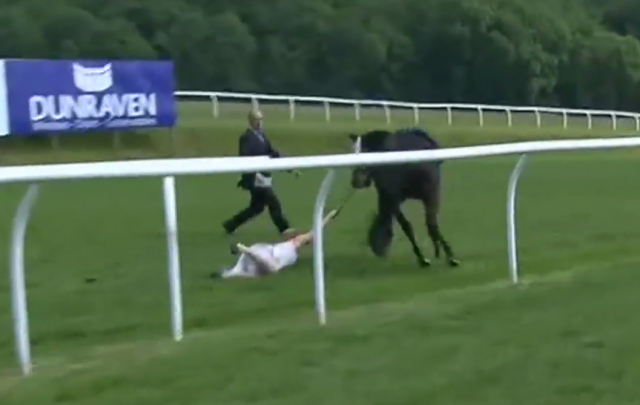 Certainly, this is above and beyond the duties of a race broadcaster — and of course, we don’t recommend you leap out and try to catch galloping racehorses with your bare hands unless you’re pretty confident you know what you’re doing. But Hayley Moore, our hats are off to you and your heroic actions to get Give Em A Clump under control. After all, a horse girl’s gotta do what a horse girl’s gotta do.